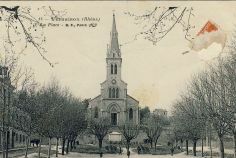 The village of Vernaison is located at about fifteen kilometres from Lyon between the Rhône right bank and the hills. Its history is divided between the territory of the river with its islands and "lônes", and the one of the hills devoted to the cultivation of fruit trees, activity linked to the famous local micro-climate. 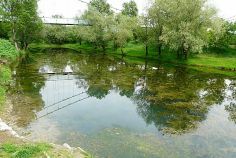 The "lônes" are the name given to the dead branches of the Rhône which welcome many varieties of fish and protected species like beavers, kingfishers or black-eared kites. The link with the river heritage can be seen through the practice of sport activities such as the water joustings which association was founded in 1887. 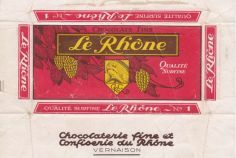 Between 1919 and 1967, Vernaison was the capital of the Malakoff, a chocolate bar composed of praliné made with hazelnuts, thanks to the settlement of the company “Chocolaterie fine et Confiserie du Rhône”! 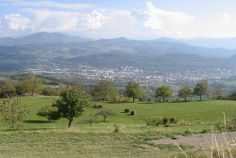 The Rhône and the fruit trees are part of the landscape surrounding the “Maison de Bon Aloi” but we must not forget, not very far from here, the vineyards and the cellars of the Coteaux-du-lyonnais, a wine which origin is controlled and which is produced in the Monts du Lyonnais at the west of Lyon.